When Jen and I moved in together and I moved to New York City it was a wild and wonderous adventure. New York City was a whole new world and our neighborhood was filled with wondrous things such as a duck wearing a plastic bag as a diaper, a guy who scooted around on a skateboard and had lobster claws for hands, and a magical restaurant called Alberto's Mofongo House. This new universe left me with a lot of questions. Why have a pet duck in New York City? If you have a pet duck why make it wear a diaper? How does a man have lobster claws in place of human hands? And what the hell is mofongo? I never got answers to any of these questions except for the last one. 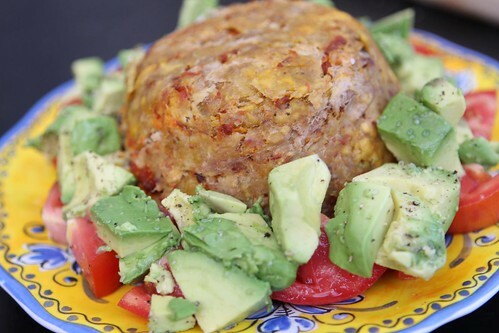 The answer, put simply, is that mofongo is delicious! Wanting to rekindle our roots (the kind of roots one lays in their late twenties anyway) I picked up some pork mofongo tonight from El Malecón, an institution in our old neighborhood. I served it up on a plate with some freshly cut farm tomatoes and avocado. Things have come a long way since we moved in together over eight years ago. This morning, for example, instead of waking up and walking to the bagel place by our house to marvel at the bagel-slinging prowess of the workers I woke up to try to soothe Martin who was freaking out. Eventually I just rested him on my pillow and we drifted off together for a few last minute winks. 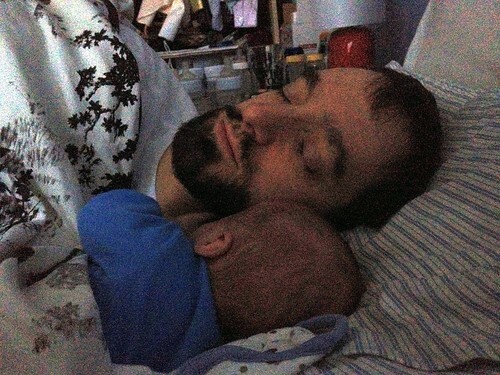 Yesterday began much the same way, but with Elliott requiring the additional daddy snuggles in the morning before work. After I left for work Jen was left alone, again, to pick up the farm share. 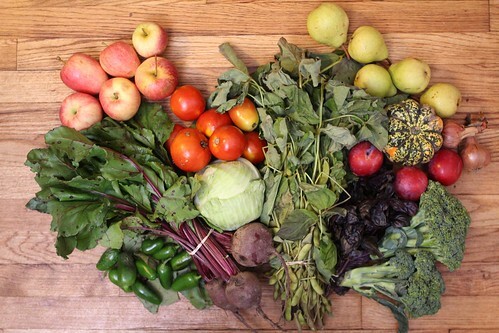 This week we got more tomatoes, edamame, broccoli, green fall cabbage, carnival winter squash, Red Ace beets, Basil, Shallots, Gala apples, Bartlett Pears, and peaches. 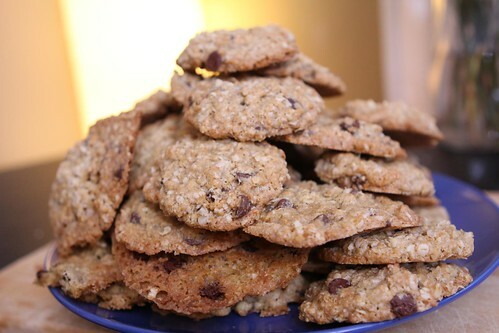 Tonight I came home to a huge pile of cookies that Jen had baked. This is just about the happiest thing that can happen to me in a day. I didn't really have any appropriate beer to serve with mofongo. This is probably good because I would wager that mofongo is generally served with low quality lagers. 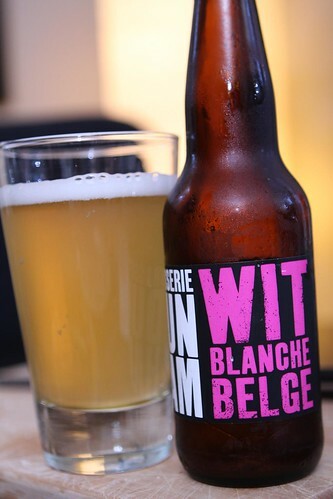 Instead I enjoyed this Wit Blanche Belge from Brasserie Dunham in Quebec, another gift from Jen's father. This was an excellent beer, completely different than I'd expected. It had a fresh lemony taste from the hops and reminded me of the Sorachi Ace from Brooklyn Brewery. After dinner I tried to get Elliott into some pyjamas but, sadly, they are both pretty much outgrown their first crop of clothing. 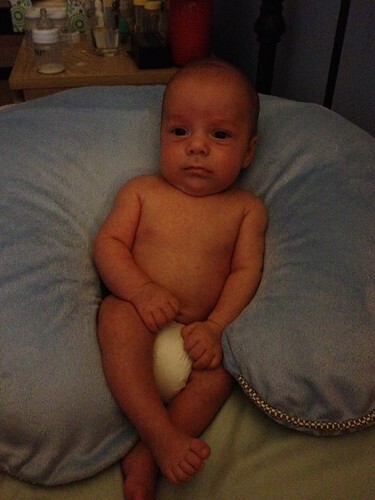 So, instead, I like to sit them up in nothing but their diapers. Elliott, in particular, looks like a little beefcake when sporting this look. And I can't get enough of calling him a beefcake.